Donatello: Hi, Beetlejuice. Um, this is going to sound a little weird, but...why the hell is your head so tiny? Beetlejuice: Long story short? Kicked a midget. Beetlejuice: Yeah. I did. I kicked a midget. 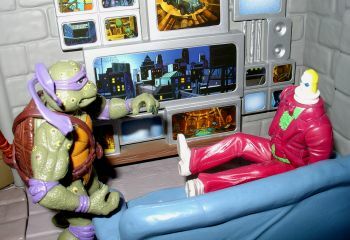 Donatello: Forgive me, Master -- I hope I'm not disturbing your meditation. 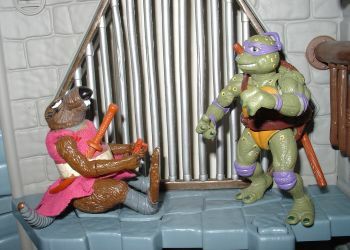 Splinter: Not at all, Donatello. I sense that you have come to ask me a question...what troubles you, my son? Donatello: Troubles? Nothing...I just wanted to ask you about your right ear. For a project I'm working on. So tell me, Sensei, how did you lose the top half of it? Donatello: Yeah, I know the story, but here's the thing. That's the movie origin story -- I should know -- and the story from the comics. You, on the other hand, are associated with the cartoon, which means you are Hamato Yoshi. So you couldn't have gotten your ear sliced when you were an ordinary rat, because you never were an ordinary rat. So tell me, Master, how did you really lose half of your ear? 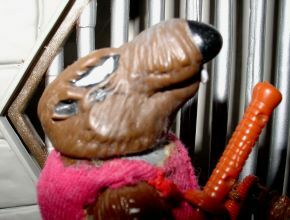 Splinter: If you must know, my son, I will tell you, though it is not something I am proud of. Following my mutation, I was angry at the world -- being a sewer-dwelling hobo is one thing, but being a sewer-dwelling hobo mutant rat is quite another. At least a human hobo can walk the streets sometimes, and while he is sneered at by passersby who turn up their noses at his sewage stench, they do not flee in terror as they would from a mutant rat. I could only venture above at night. And, on one such night...I kicked a midget. 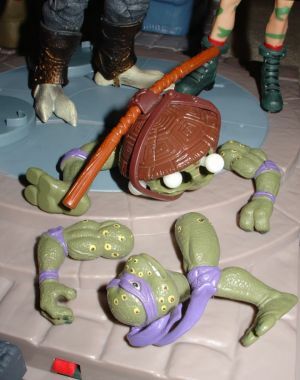 Rat King: Yo Donatello -- you seem kinda down, bro. Care to share? If you dare? Ha ha. Donatello: *Sigh* Well, RK, it's just that this is so frustrating. I'm trying to conduct a very scientific survey here to learn more about the causes of various deformities and abnormalities among our population, but everyone so far seems to be giving me the same answer -- and it just doesn't make sense. I don't know how or why, but I think they're mocking me. Rat King: Well, who have you asked so far? Rat King: Only two people and already you're discouraged? Haven't you been watching "Mad Mad House" on SciFi? You'd already have gotten a necklace for "lacking patience," like that crazy fat chick they kicked out the other week. Why not try asking me your question? Donatello: Heh, yeah, I guess you're right. Thanks, RK -- I really appreciate the pep talk. So tell me, then, what happened to turn you into a chewed-up rag-wearing guy who hangs out in sewers with a bunch of albino rats and has chicken bones and dead insects stitched into his clothing? Rat King: Kicked a midget. 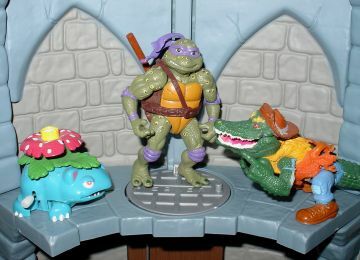 Donatello: I don't even know why I'm bothering, but I've got a couple of questions for you guys. Okay? Good. Let's go. Leatherhead, you used to be a human, right? Weren't you once a Bayou thief named Jess Harley? Leatherhead: Ut! Dat be de story some say's behind mah origins, Dawn-ah-tell-oh. But dat ain't de only story! Dere be many stories 'bout ol' LEATHAHEAD, ah gah-rown-tee! 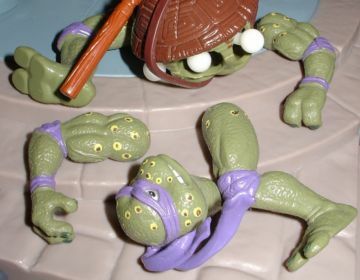 Donatello: Yes, but what really happened to turn you into a mutant alligator? Leatherhead: Ah reckon you want de trute, Dawn-ah-tell-oh? Ah tells ya den -- before ah became ol' LEATHAHEAD, ah once...kicked a midget, ah gah-rown-tee! Donatello: Yeah, whatever. And Venusaur -- why do you have a flower growing out of your back? I suppose you'll tell me that you kicked a midget too? 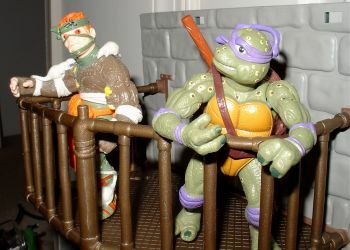 Donatello: I hate you both. 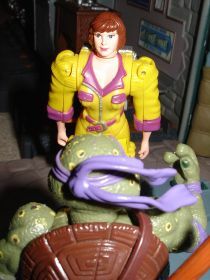 Finally, stressed-out and dejected, Donatello approaches April O'Neil. April: Hey Donnie, how are you? 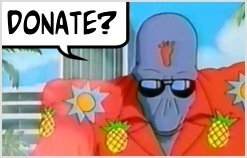 Donatello: Not so great, April...but hopefully you can help me out by answering a few questions... So how about it, huh? MAY I QUESTION YOU? PLEASE?!?!? April: Um, sure, Don...but please don't shout at me, kay? 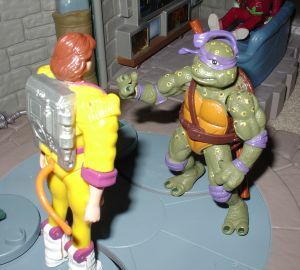 Donatello: Sorry...I'm just at the end of my tether here. Hahahaha! Anyway, let the questioning begin! Donatello: Why do you have a tail? And why are you wearing those Japanese schoolgirl socks? TELL ME!!!! Sorry. 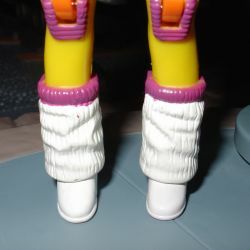 Donatello: And why are you wearing those Japanese schoolgirl socks? TELL ME!!!! Sorry. 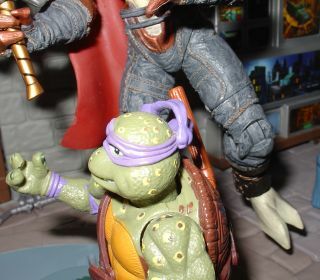 Donatello: And why are your shoulders so goddamned broad? DID YOU KICK A MIDGET TOO?!?!?!? Donatello: What? NO!!! I'm asking the questions here, understand? See, like that! HA HA HA! April: ...LOOK OUT BEHIND YOU!!!!!!!!!! 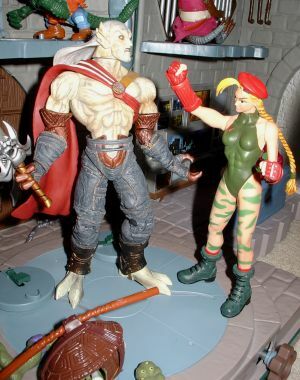 Cammy: Alright, what the bleeding HELL happened here?!?!?!? 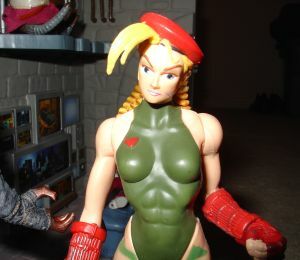 Cammy: Blimey! This is just...unacceptable. Bugger all. What did you do this time, Kain?